From the time you start the application process to graduation and beyond, the faculty and staff are committed to helping you meet your personal, educational, and professional goals. From dedicated librarians for each graduate program to faculty mentors, and skills training workshops to career counseling, we are committed to your success. Advance your career through an innovative curriculum designed to meet critical needs. Join a community of scholars who come from all walks of life. Learn academic theory and practical skills to better yourself and your profession. Data is everywhere. The insightful interpretation of it isn't. You have that talent. It's time to master it. An advanced degree for you, a higher level of care for those whose lives you touch. Health care is becoming more complex every day. Don’t just play catch-up. Lead the change. Guide the field. Make it better. 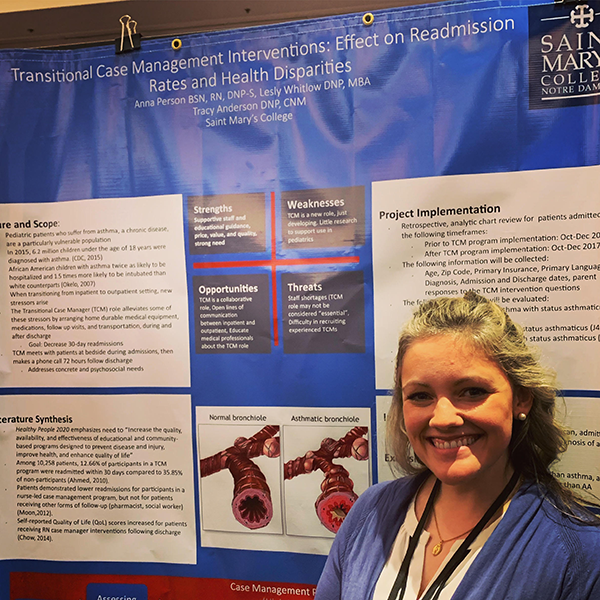 Several Saint Mary’s College graduate, undergraduate, and faculty research posters were presented during the demonstration hour at the Indiana Speech-Language-Hearing Association Convention 2019. Complementing their online coursework, students in our Doctor of Nursing Practice program meet one time per semester on the Saint Mary’s campus to engage in face-to-face activities and lectures. Deciding where to earn your graduate degree is a big decision. The first step is learning all you can about what we have to offer and how you can use it to shape your future. Seven DNP students were inducted into the Sigma Theta Tau International Honor Society, Nu Omicron Chapter, on Friday, March 29: Jacquelyn Adams, Megan Bontrager, Jannet Everson, Sarah Hunyadi, Kelly Leard, Geena Mapoy, and Yumi Otsuka. Masa Gumiro will be the first graduate student to present at the third annual Research Symposium. His Data Science practicum project "Tire Pressure Monitoring System" provided a custom solution using IoT (Internet of Things) sensors to monitor tire pressure and provide notifications in real time. Catherine Shah, Kate Person, and Brianna Acosta '18 presented their individual practice innovation projects at the Midwest Nursing Research Society's annual conference in Kansas City, MO.